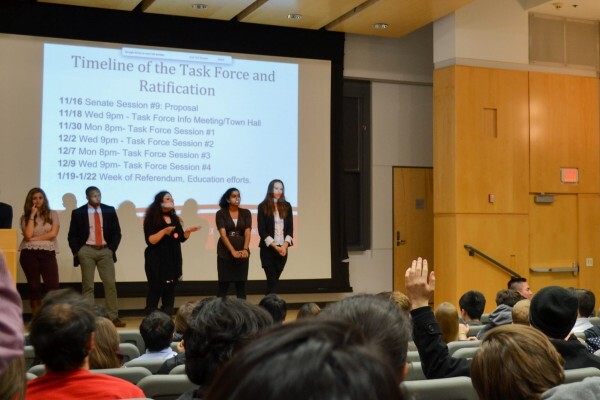 Tensions ran high at the Student Government senate meeting on Monday night, one week after the impeachment, removal, and protest of removal of two executive board members: former Vice President of Finance Kimberly Barzola and former Vice President of Internal Affairs Marwa Sayed. At the meeting, the senate voted to table for two weeks a proposal, brought forth by a group of students led by Towers Senator Marian “Mim” Eiben, that would dissolve senate immediately and create a task force to write a new constitution. 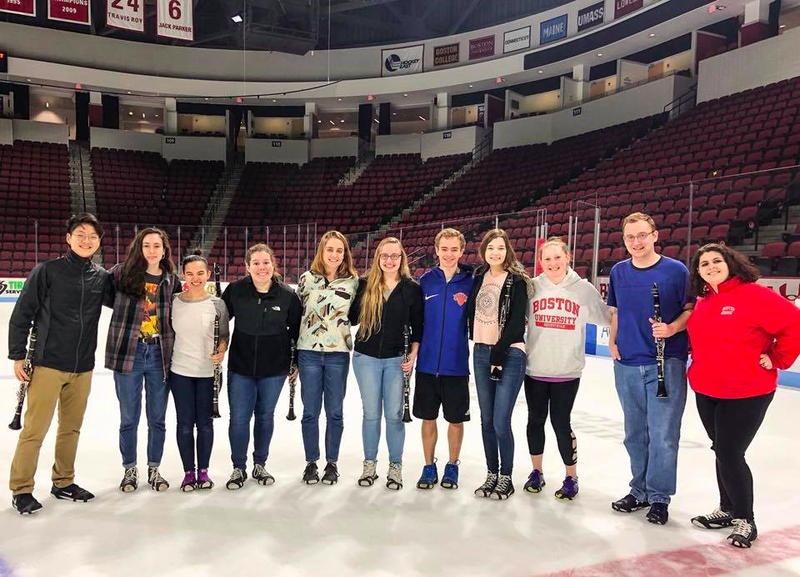 The task force would be open to all students, with the goal of creating a new constitution that reflects the needs of the entire student body. The current senate would be dissolved and E-board would be allotted an emergency discretionary fund while the new constitution was being crafted. 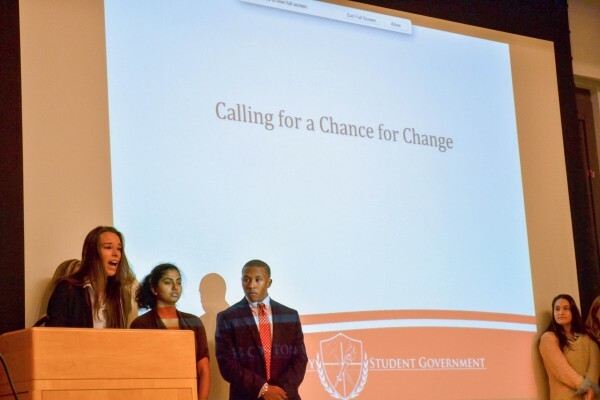 Eiben, along with members of Student Government and Students Against Silence, created the proposal “Calling for a Chance to Change” in an attempt to unite the student body to reform Student Government. 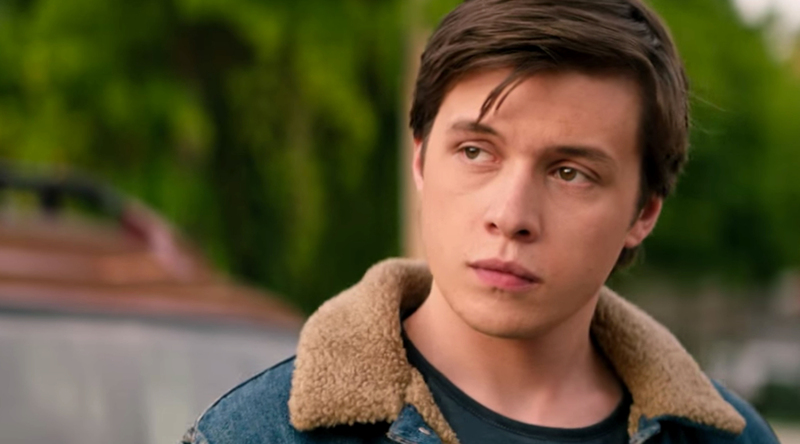 “People were considering bringing together a bunch of different proposals that didn’t collaborate, and they’re all essentially saying that same thing — that something is wrong, it needs to be fixed,” Eiben said. The group also believes that last week’s events revealed the deep-seated problems within student government, especially the senate. 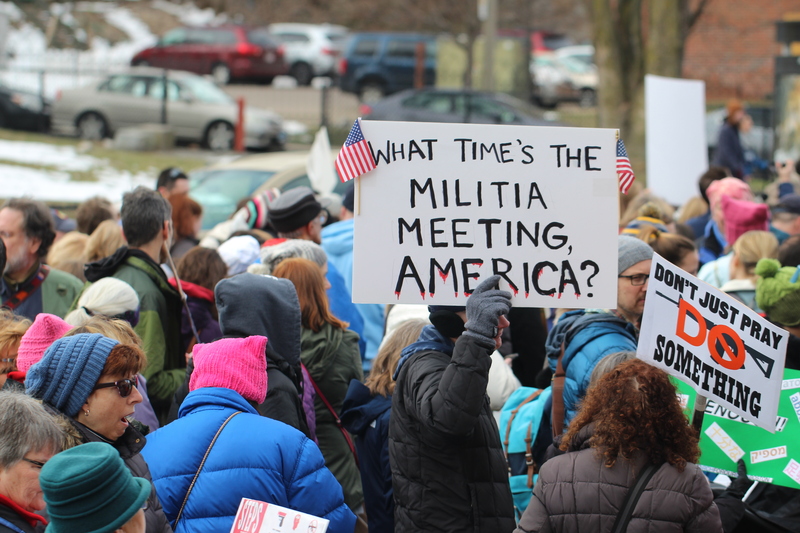 An amendment to the proposal, motioned by CAS senator Daniel Collins, suggested a compromise: the task force to create the new constitution would still go into effect, but senate would remain in session until a new Constitution was ratified. His amendment passed with 24-1, with 14 senators abstaining from the vote. After voting in favor of Collins’ compromise, South Campus Senator Daniel Schwartz motioned to table the proposal for two weeks. This motion passed 26-8, with 5 abstentions. Schwartz said that the Senators did not have enough time to fully understand the proposal and get constituents’ opinions about it. Samantha Day (CGS ‘19), a College of General Studies Senator, said she abstained from voting on the motion to table the proposal because the senators did not have “an adequate amount of time to figure out the stipulations of everything and get feedback from [their] constituents,” as the senators had just received the proposal the night before the meeting. Myles Standish Senator Jonathan Franco (COM ‘18) also abstained from voting on the amendment Collins proposed, but voted yes on Schwartz’s table proposal. Aidan Donohue, a CGS Senator, abstained from voting on the motion to table the proposal because he would have preferred a compromise between those who wanted the senate dissolved and those who did not. Franco believes that senators must now move on to finding out what their constituents think of the proposal so that a decision can be made in two weeks. “The first order of business for myself and for every other senator is to talk to as many constituents as possible, whether that’s going door to door, polling, or surveying,” he said. Some students, such as Diana Abbas (CAS ‘18), were dissatisfied with the decision to change the original proposal and wait two weeks before voting on the amended one. Abbas said that the senate is “illegitimate” because it does not represent all of the student body, and therefore should be dissolved immediately. Many students believed that letting the senate continue to preside would not result in any real change. 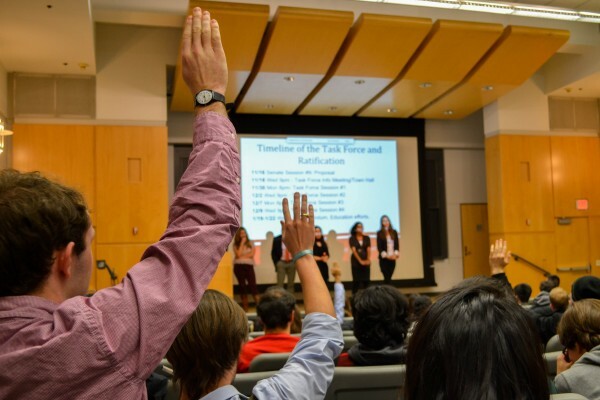 Other students were upset about the results of Monday’s meeting because they believed some senators were “quick” to impeach and remove Kimberly Barzola and Marwa Sayed but wanted two weeks to decide on the proposal. The senators, on the other hand, are trying to fight against the stigma that they do not take their constituents’ best interest into account. Overall, senators such as Kilachand representative Josh Smith-Sreen (CAS ‘19) seem to think that the best solution is compromise, but compromise is difficult when tensions are so high. Eiben is upset that her proposal was amended and tabled, but is more disappointed that the Student Government was not able to come up with a good solution to their various problems.